*Rated #2 Steam Iron , October 2014. 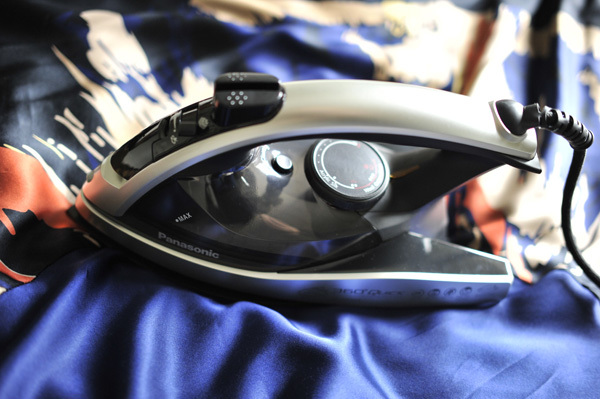 "The 2 Panasonic $130 also has a long cord and superb ironing, but this iron is big" by the Consumer Reports Magazine. 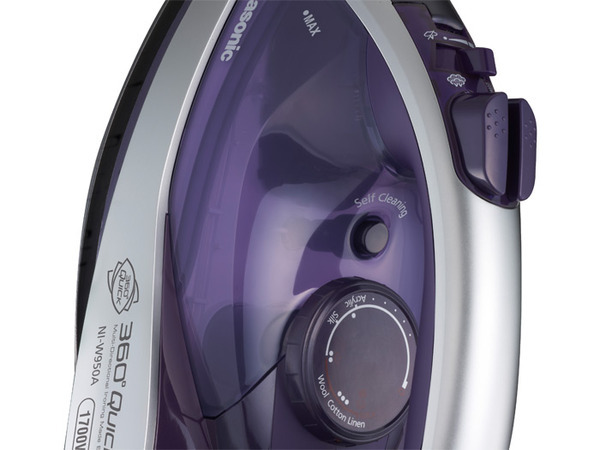 "Summary: This 1700-watt steam iron has an anodized aluminum soleplate, ready light, auto-shutoff, a safety feature that powers the iron down when left stationary for a short time, and a self-clean feature". 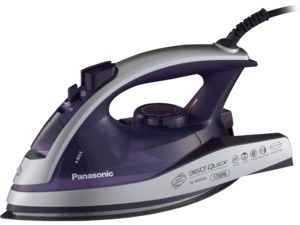 Panasonic™ NIW950A 360° Quick™ Multi Directional Steam/Dry Iron. Ceramic iron curved alumite soleplate. Anti-calcium system. 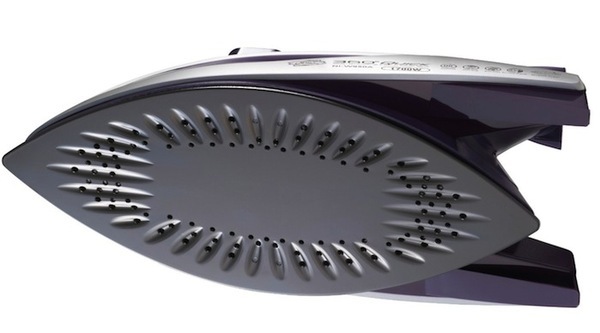 Introducing the Panasonic™ NIW950A 360° Quick™ Multi-Directional Steam/Dry Iron. Multi-directional ironing is made painless with the Panasonic NI-W950A! 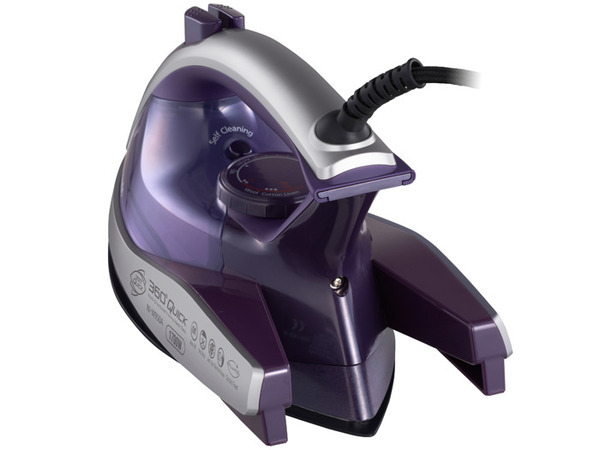 Featuring Panasonic's trademarked dual-tipped elliptical soleplate, specially crafted for #1 hardness and smooth ironing. The secret is in the unique Alumite soleplate coating. Alumite is a durable material that is used to make automobile parts. This coating drastically extends the life of the iron soleplate, providing up to 5X better scratch resitance, stain resistance, and a smoother, non-stick glide over the competitors. The soleplate's expansive surface area is ideal for larger and tougher fabrics, such as curtains and tablecloths. It can also cover tight spots like collars and cuffs—allowing you to finish the job 25% faster. The wide ironing area is 28 cm in direct contrast to virtually all competitors, with only a soleplate of 25 cm. The vented soleplate allows for a powerful burst of steam, the unique self-cleaning mode, and an anti-calcium system for extended performance. Furthermore, the adjustable steam feature allows for more minute calibrations, letting you tweak the steam to perfectly suit your favourite fabrics from high to low, steam to dry. The Panasonic NI-W950A. A stronger glide. A tougher plate. A tougher machine. Anodized aluminum is an excellent heat conductor, highly scratch resistant, and extremely durable. The Alumite soleplate also glides smoothly on various materials to ensure exceptional ironing. This patented soleplate design allows for quick and effortless multi-directional ironing. Convenient extra long cord length. Our mercury-free electronic sensor automatically shuts off the iron after 10 minutes if it is left in the upright position. 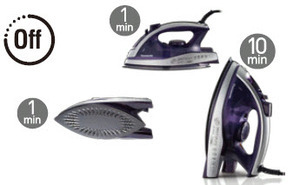 The iron will also turn off after 60 seconds if it is tipped over on its side or left unmoved on the soleplate. Thanks to putting steam holes around the entire edge of the soleplate, more steam can be generated over a wider area. The powerful shot of steam eliminates stubborn creases and wrinkles. This feature also allows you to direct a burst of steam to hanging garments. The adjustable steam settings allow you to select just the right amount of steam required for your ironing needs. Choose regular steam for heavier fabrics or light steam for touch-ups. When pressing the auto clean button, the water is fed into the vaporizing chamber in the tank to clean the iron. A powerful shot of steam is released to take away the scale that build up around the steam holes. 360 degree steam direction grooves on soleplate. Wings on each side allow iron to be stood up on it's heal, while still maintaining multi directional ironing tips at front and back. 360 Quick Multi-Directional Ironing Made Easy. Patented Dual Tip Curved Soleplate: This patented soleplate design allows for quick and effortless multi-directional ironing. Alumite Soleplate Anodized aluminum is an excellent heat conductor, highly scratch resistant, and extremely durable. The Alumite soleplate also glides smoothly on various materials to ensure exceptional ironing.